Be the first to share your favorite memory, photo or story of Dr. George. This memorial page is dedicated for family, friends and future generations to celebrate the life of their loved one. 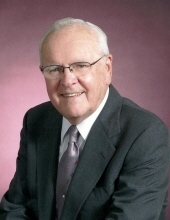 George Ross Laidlaw, 86, of Lakeland, formerly of Riverview, went into the presence of Christ his Savior on Wednesday, March 27, 2019. A native of Simcoe, Ontario, Canada, he was a "retired" clergy and has resided here for 22 years coming from Palm Springs, CA and was a member of Bethel Baptist Church, Lakeland, FL. He is survived by his wife, Rose; son, Judson Frank (Lori) Laidlaw; daughter, Linda Beth (Steve) Jones; sister, Margaret Roberts and 5 grandchildren. A celebration of his life will be held 11:00 A.M. Saturday, April 6, 2019, at Trinity Baptist Church, 702 Del Webb Blvd W, Sun City Center, FL 33573. A reception will follow at the church. In lieu of flowers, please make donations to the Salvation Army or Trinity Baptist Church Missions Committee. To send flowers or a remembrance gift to the family of Dr. George Ross Laidlaw, please visit our Tribute Store. 702 Del Webb Blvd W.
A reception will follow at the church. "Email Address" would like to share the life celebration of Dr. George Ross Laidlaw. Click on the "link" to go to share a favorite memory or leave a condolence message for the family.